I have already relayed why I enjoy English bitters so much, and so I continued my quest for the perfect pint of bitter. I decided to stick with a very simple recipe, 90% base malt, 10% crystal malt, but this time, I tried two new grains, Optic for my base malt, and Simpson’s medium crystal malt. On top of this, I tried some new yeast. The yeast is London III with I got from a local brewery, Black Bear Brewing. I have no idea how many generation in we are, but I was told this is a strongly top cropping yeast, with a great “English” flavor. If you are ever in northern Maine, check out Black Bear’s products. The red and the porter are particularly good. 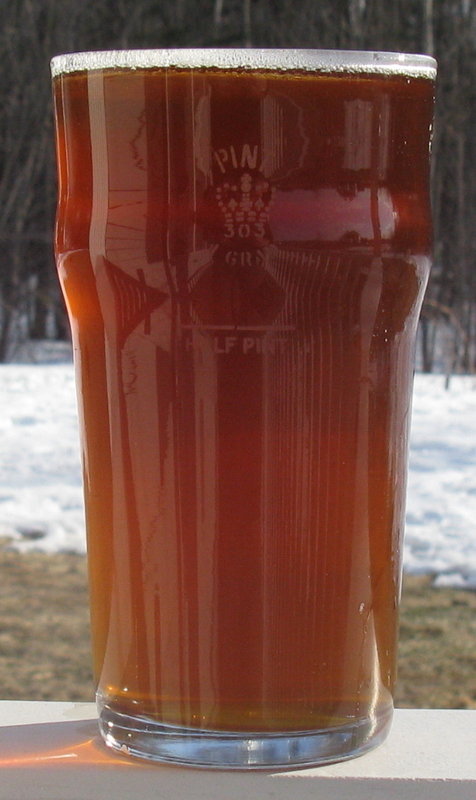 Additionally, there was a terrific thread about trying to get more “English” flavor in homebrews on Homebrewtalk.com. What is meant by this is the fruity esters you get from the yeast, very characteristic of traditional English ales. As someone in the thread pointed out, Fullers goes through a very elaborate temperature control program to try to boost the esters from their yeast, and keep it from “cleaning up” too much after itself, while at the same time keeping the diacetyl level down in the beer. Diacetyl is a compound that in small amounts gives beer a slight butterscotch taste, but in large amounts smells like artifical butter flavoring. A small amount is OK in English beers, to much is not. So, I decided to try out a new temperature control system. Using my trusty Ranco, I got a thermowell to go into the beer. Combined with a fermwrap I can dial in the temperature pretty accurately. I also have a new 6 gallon Better Bottle that I am switching to for fermenting my “clean” beers. I like glass, but am concerned about the safety issue with carboys. I usually ferment in large plastic buckets, but I like the idea of being able to see what is going on easily. I also usually ferment my bitters with the lid put on, but not clamped down, to allow oxygen to creep in, trying to recreate the open fermentation tanks used so often in the UK but in a dusty basement. So, to duplicate the open fermentation, I just put some sanitized foil over the port for the airlock on the hood, and just left the airlock off for fermentation. The plan is to start it fairly warm to get the esters, then cold crash the fermentation 1 day after it seems to have stopped. I want to give it time to clean up the diacetyl, but leave it a little “raw” for more flavor. I did an infusion mash at 154F. I let this ferment for 7 days. It started at 64F when I pitched the yeast, but I warmed it too 68F in a few hours. Then, I let the yeast do its job, and it got up to 71F at the peak of fermentation in 2 days, and then started to cool on day 4. I took hydrometer readings day 4, 5, and 6 The hydrometer did not change between day 5 and 6, so I let it sit for 1 more day, then put the whole thing into my keg cooler. One point, I have never seen yeast sit at the top like this does. They are not kidding when they say it is top cropping. When it went into the cooler, it still had about 1/2 an inch of yeast floating on the top. I let it sit overnight in the cooler at about 40F, and then I racked it off into a keg. If I was not kegging, I doubt I would do this, as I would be worried about dropping too much yeast out to carbonate. I also decided I wanted to keep this as close to the real deal as possible, so I put enough pressure on the keg to seal everything, then I turned off the gas. Every day, I would check that the keg was still pressurized, and then I would give it another hit of gas for about 10 sec, then shut it off. I want the keg sealed, but I don’t want the beer very carbonated. I will not drink this fast enough to be a true “cask” beer, but I also don’t want it getting much more carbonated. Tasting: Oranged hue, with a slight cloudiness. The beer is almost flat, and at cellar temperatures. The nose is fruit esters dominating, with a slight toasty, cocoa smell. This is followed by an earthy aroma which I believe are from the hops, but they are second fiddle to the esters. The first thing you taste is the fruitiness of the beer, followed by malty/toasty, and finishing with a long, soft, malty finish balanced by the hop bitterness. It has a light, soft mouthfeel, and is very easy to drink. Critique: I am very happy with this beer. First off, the yeast is fantastic. The flavor profile is very English, and it really accentuates the malt. I am also very happy with the Optic malt. It seems a little softer, I think, then the Marris Otter I usually use, a bit fuller in malt flavor and not quite as sharp. The Simpson’s crystal malt also brings quite a bit, the malt is there, and the cocoa notes I could taste in the grain are there in the background. I am very happy with this. 14 days from kettle to glass, about 3% ABV, but tons of flavor. I will have to brew this a few more times, but I feel this is a pretty solid recipe. I am sold on the Simpsons crystal. I will likely try Marris Otter base malt in this recipe as opposed to Optic just to see the difference. I may also give Golden Promise a try in the future. I also think I have found my new favorite English yeast. The nice thing about that yeast in a beer like that is that you can propagate/re-use it almost indefinitely. Plus there’s an easy local source for more as well!